srinagar-leh road | high road to..
Border Roads have now cleared the Zoji La pass , and expect to throw the road officially open ” within a few days “. Congrats to all in Leh on the upcoming feast of first fresh veggies etc . since December. Srinagar-Leh will open tomorrow , according to The Tribune. This may actually happen, since the BRO road crew was a few klicks from the Zoji La pass a week ago. There is still a conspicuous lack of details though. Weather forecast says says rain five out of six coming days in Srinagar , thinning out towards to Kargil and Leh , night temperature just under zero , so more snow is definitely possible . No mentions of the the earlier bold BRO claim that the road would be thrown open on March 31 – but still good chances of this becoming the earliest opening of the road in more than a decade , the former record was April 15th in 2008 . That turned out mildly chaotic. Srinagar-Leh : first the road will be cleared up to Sonmarg ( this year March 16th ) , then the Zoji La will be almost cleared and the first loads of fresh supplies will come in to Leh …with donkeys ( last days in March , this year ) .A few cabs will get in before the road is officially thrown open. Lastly the roadmarker at the LAHDC site will show open when the road is deemed fit for all vehicles , i.e. busworthy. Manali-Leh : first there will be rumors , like this years classic when some Indian media claimed that the whole road would be cleared by April 15th. Clearing the road starts in March , with three BRO groups working at the same time : two crews working from south ( Manali ) and north ( Koksar ) end towards the Rohtang La , and the third crew working going past Darcha towards Baralacha La and the 5000+ passes beyond that . Once the Rohtang has been cleared ( BRO´s goal at present : mid-April ) all groups will unite in the push towards Leh. There may or may not be a period ( like in 2011) when the road is declared officially open , but not for buses : ” Open For LMV” , i.e. Light Motor Vehicles , including minibuses. Last of all the Rohtang will open for the daytrippers from Manali. This year the plan is introduce one way traffic , up only in the morning hours , down in the afternoon. Srinagar-Leh and Manali-Leh are military priorities , and get a lot of resources. The NH 22 route , Shimla-Spiti over the Kunzum La will open later than Manali-Leh , and the road over Saach Pass even later. Veggie bonanza : Srinagar-Leh road declared open April 25th, meaning fresh food coming in to Leh now. May 1st : from Keylong admin : open road over the Rohtang to Manali.Some taxis have started to cross , the daytrippers are being held back … and one very solid report , May 12th, of the first taxi reaching Darcha from Leh : official opening should come very soon.Light snowfall over the Rohtang & Baralacha La May 13th. April 29th : snowfall closes Leh airport and Khardung La over the day. April 26th : taxis made their first try to cross the Rohtang La , which was aborted due to an avalanche clipping the road at Rani Nallah. Bulldozers from both the Marhi (south) and Koksar (north) end have met on the top of the pass. Confirmed by the BRO April 26th.Road still closed at Marhi. Kargil-Padum road open , confirmed by Kargil admin. Private buses to start on the 25th according to The Tribune. .. in a real sense at the moment: five inches of snow blocking the Zoji La , and more in Gulmarg. Weather forecast : cloudy , possibly light dustings of snow in the coming days. UPDATE : re-opened after last snowfall on the 11th. Khardung La and Chang La out. Minimal snowfall , partly cloudy in the coming days weather forecast. India Met Department has issued a severe weather warning today , August 12th , for the coming two days in Himachal Pradesh and Jammu & Kashmir. Weather forecast says rain five out five coming days in Manali, Srinagar and Leh , and yr.no projects the peak rain in Manali at 54 mm on the 16th. UPDATE , AUGUST 14th :Roads and railways in HP have been heavily hit in the weekend with the heaviest rainfall in Una for more than twenty years: railway bridge at Jogindernagar out , Beas river flooding over long stretches of the road ..
UPDATE , AUGUST15th : Traffic running again on Chandigarh-Manali and Pathankot-Mandi stretches. Rohtang La on the Manali-Leh highway is out after heavy snowfall , snowfall in Keylong as well.More heavy rain to be expected on Tuesday according to Met Department, yr.no predicts moderate rainfall. Weather forecast looks good for Srinagar-Leh. UPDATE , AUGUST 19th : Sunny weather forecast for the coming week, roads still affected. 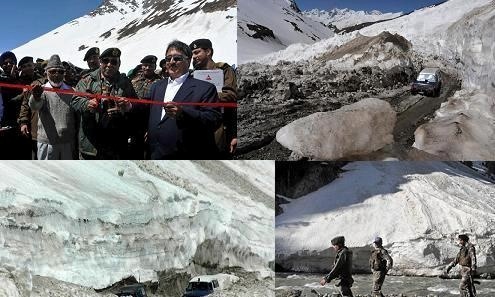 “The snow clearance operation on the highway has been completed and the road will be thrown open for vehicular traffic on May 2”, said a senior Border Road Organisation (BRO) officer. …and now confirmed on leh.nic.in : the Srinagar-Leh highway re-opened yesterday. Fresh veggies for all in Leh.